Out to dinner | Can I Bring the Dog? Eva’s Garden supplies greens, edible flowers, herbs, and more to restaurants from Portland, ME to New York City. On Saturday night a small bakery/coffeeshop/cafe near the farm, called Beach Plum, was having their test evening – the first night of summer dinners – and they invited Eva and her staff to come on over and try it out. I was thrilled to be part of the group (farmers can be picky about who they socialize with, if you’re too “city” you may not get invited), and even more thrilled when packing manager Bill called ahead to ask if they were having outside seating that evening, and if so, could Chico join us. Yes, yes, please, no problem. Eva knew “the old Chico” and she was not sure it was a good idea, so instead of carpooling, we took my car in case Chico needed to bail out. And, like carrying an umbrella to keep the rain away, the back up measures were completely unnecessary. My good boy laid right between my feet and Ashley’s feet and never made a sound, and never went begging at other tables. Eva was so impressed by his good behavior, she could hardly stop talking about it for a whole day. Oh, and the food was delicious. 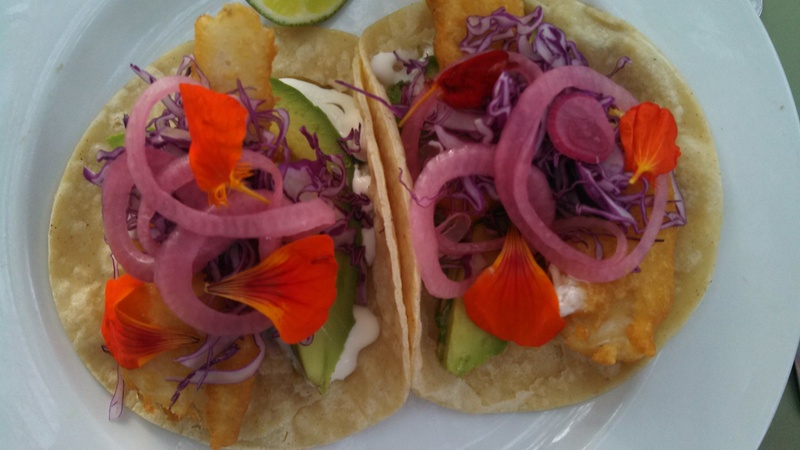 Fish Tacos with edible flowers from Eva’s Garden. Even if we don’t do well at the agility trial down here, visiting Eva’s always gives Chico a chance to grow. There’s a constant stream of people in and out, I repeatedly assure him that “at Eva’s, everyone is a friend” and he’s getting the hang of choosing to come to me for a treat when someone arrives, rather than going to that person and barking at them. Win-win-win. 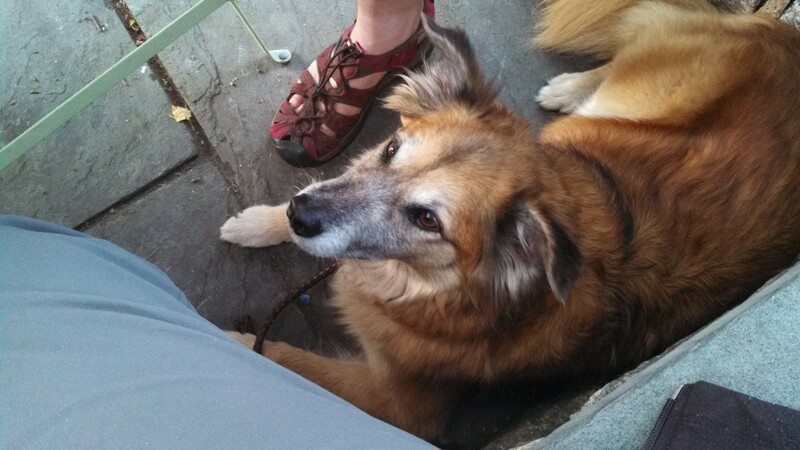 This entry was posted in Uncategorized and tagged Field Trip, socialize dog, yummy food. Bookmark the permalink.